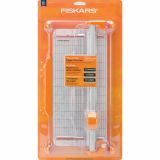 Portable Rotary Paper Trimmer 12"
Portable Rotary Paper Trimmer 12" - FISKARS-Portable Rotary Trimmer. All paper crafting enthusiasts know a rotary trimmer is a must-have. For making scrapbook layouts, borders, gifts, cards, gift bags and tags for everyone you know, it's the tool you can't do without. Cut up to ten layers of paper all with ultra-precise cuts with the built-in 12x6in grid it's an effortless way to do it all. Deckling, perforating, pinking, scalloped blades and more are available separately and these blades are easy to change. WARNING: This product contains chemicals known to the state of California to cause specific health risks. Trimmer measures approximately 16x8x2-1/2in. 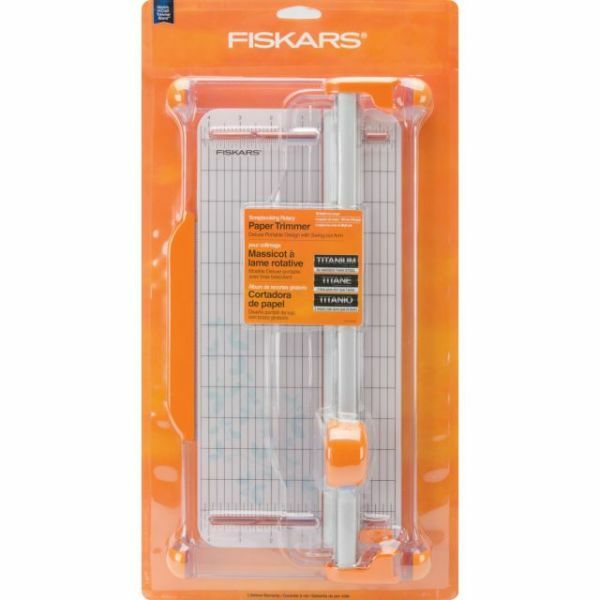 Trimmer colors are Fiskars orange, white, yellow and aluminum. Imported.